Scientician: Bed For Sale! Make us an offer!! Zed and I have a queen size bed that we need to get rid of so we can convert the downstairs bedroom back to a useable space for the teenage boys. I'm afraid I cant give this bed away (as much as I would love to!) as I have to recoup costs from having zeds parents stay. 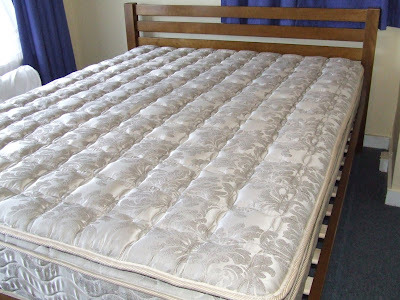 So its a queen size slat bed with very comfy pillowtop mattress. This bed is probably medium to soft. Solid wood frame. This bed cost $1455 new as we upgraded to a high quality mattress. Only used as a guest bed for 3 months so its still in tip top condition. So make us an offer! or it goes on trademe! Horrors! Sus we can take it if I can get it through the bedroom door - do you need the twin beds we have or do they go to trade me! - if you have time to go round to 9A andcheck with Tony to see if it will fit we'll pay you full price.